Rental Car Damage Claims? That Hertz. If you’ve rented a car and returned it only to be landed with a large and unjustified ‘damage’ bill, I know your pain. Here’s how I dealt with it as a guide for others who find themselves in the same situation. I rented a car from Hertz (known in the UK as Hertz (UK) Limited, Hertz Rent-A-Car Limited and Hertz Europe), but before I go on, allow me to tell you the UK postal address for both of these companies, as its impossible to find them on their company website, for, I suspect, very good reasons I shall come to shortly. It’s the same address for each one – they’re all based in the same place. I rented a car for a period of 3 days, at a cost of around £35. On picking the car up, I was asked if I wanted to take out the SuperCoverTM insurance product for the car, the charge for which would have doubled the cost of the rental, and so I declined. There are a variety of ‘optional’ charges that you’re invited to take out when you pick up the car – charges which are not made evident when doing a price comparison search, or when getting a quote from Hertz’ own website. At the point of picking up the car, you’re generally on a schedule and need to get going, so unless you suddenly want to lumber yourself with a giant rental bill for things you’re not sure you need, or you want to spend half an hour reading through the fine print of something you’ve just that second been offered (and who does? ), you say no and take the car as is. Of course, a shrewd consumer would have read-up on every aspect of car rental beforehand and would be fully conversant with all the possible options, but the real world you want to a rent a car very irregularly and not have to engage in a research project in order to do so. A lay consumer cannot be expected to know what constitutes ‘damage’ in the context of car rental. They will naturally be led by whatever determination the salesperson makes at the time and are unlikely to challenge it. This makes the notion of the customer being capable of validating the salesperson’s assessment incredible. The document itself is abbreviated, unintuitive, and in this case, poorly filled in. Take a look at mine and at the damage notation key below the diagram of the vehicle. There appears to be some kind of marking to the top right edge – is that a circle (a dent), or a triangle (a chip)? It’s so badly denoted that it could be either, or indeed it could be a smudge or an errant pencil mark. Actually I can tell you the damage to the car in this area was a long scratch, and so the marking you see should have been a square! Tyre Tread and pressure – just how is a lay customer supposed to make an assessment of tyre tread? Only professional mechanics can make such determinations, especially using something as granular as a 1-10 scale. And pressure? I wasn’t given the option of manually checking this myself, so that’s rather impossible to verify too. Vehicle Bodywork: Scratched over 25mm OR any length when down to the base coat. Dents over 25mm OR any panel with more than two dents of any size. Glass: Repair: Stone chips over 2mm in diameter. Replace: Screen damage greater than the size of a One Pound coin. Cracks to the glass including front rear and side windows. Tyres: Repair: Where a repair is possible (i.e. the tyre as not been run on flat), only the repair will be charged. 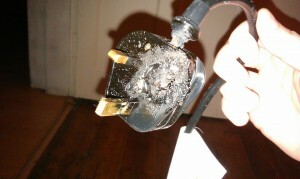 Replace: Where a repair is not possible a replacement type will be charged e.g. punctures where the tyre has been run on flat. Side wall damage (including bulges) over 20mm including the kerbing band or where tyres cords are exposed. Ancillary Components: Mirrors: Damage to mirrors. Light cluster: Damage to lights including: chips, holes, scratches, and cracks. Wheel Trims: Structural damage to the trim. Alloy Wheels: Scratches or scuffs over 25mm long. Vehicle Interior: Equipment: Any missing original equipment as noted. Trim: Damaged or missing parks to the interior trim. Upholstery: Burns, cuts, stains, or tears to the sears, carpets, roof lining, and material in the glove box/boot. There’s a potential minefield there – for example if a panel had a single small dent less than 25mm in size, it would not be noted. 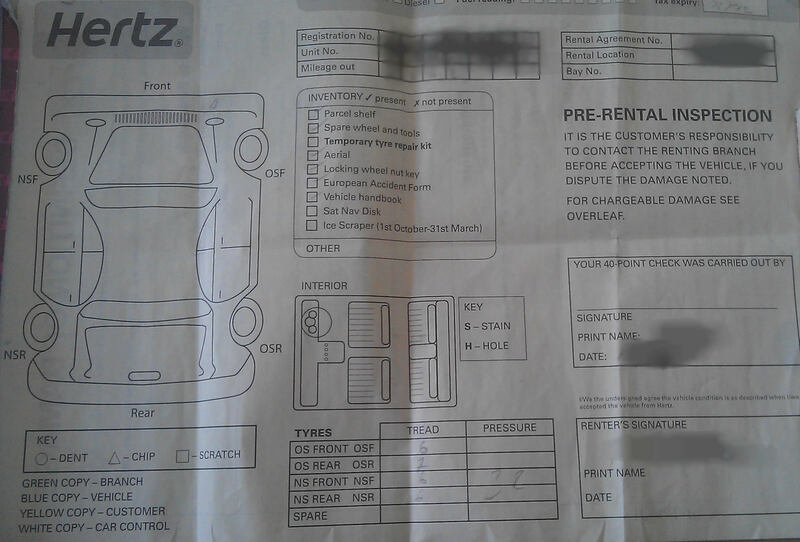 If you were to make a second small dent during the period of rental, the fact that two dents now existed would allow Hertz to try to justify a repair to the whole panel, despite the fact the first dent was not caused by you. It would be impossible to prove, because the pre-inspection document would have made no mention of the first dent. That combined with the fact that the definitions of damage here are so vague its entirely possible one person could consider a dent or a smudge to be worth noting, while another person would not. I’m digressing – back to my story. I drove the car extremely carefully for the three days, but much to my horror on the morning I returned the vehicle, I reversed it up to the front door of my local Hertz and tapped a standing post. Luckily I practically wasn’t moving when I did this, so while the contact did make a noise the actual damage to the bumper was a very light, very small graze. I inspected it before going inside and I was both satisfied and relieved to see that it was practically invisible. While I was standing at the counter waiting to return the keys, a member of staff walked past me without a word and went to look at the car. As I was handing back the keys he walks in and says to his colleague ‘Yeah that’ll be a full respray’. This same staff member then asked me to sign an ‘Accident report’ which said I’d caused damage to the vehicle by reversing it into the post. Stupidly I signed this on the assurance that what I was signing was not something that admitted any liability with regards to any damage, merely confirming the fact that it had occurred. In retrospect I should not have signed anything, because as with all documents of this kind it was just thrust in front of me and I was pressured into signing it immediately. I then went on to dispute the comment about the ‘full respray’ given that the damage was practically invisible and very small – in fact it was smaller than the 25mm ‘definition of damage’ as described on the pre-rental inspection. Incredibly the staff member said he had no knowledge of any damage size policy, but went on to tell me the damage started further up the bumper anyway, making it a larger scratch. He pointed to a smudge on the bumper where he alleged this damage started – and I demonstrated it to be a dirt mark because I then wiped it away with my sleeve to show that the area was, in fact, completely undamaged. Having been nullified the staff member then said that, in any case, he wouldn’t be the one to make any damage assessments and if there was any chargeable damage, I would be notified of it separately. I told him in no uncertain terms that I expected no charges to be made, because the damage was smaller than the 25mm definition specified, and very light. I left the office making it very clear that any damage claim would be strongly disputed. Fast-forward to 4 months later and I notice that £300 had been taken from my debit card without any warning. I immediately ring my bank who confirm it is a pending charge from Hertz. 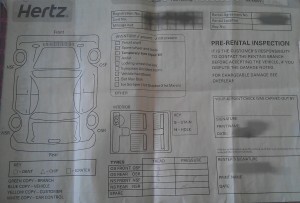 I then ring Hertz who confirm it is a charge levied for damage to my vehicle rental FOUR MONTHS before. I received no notification, no warning, and no hint that a large amount of money was being taken from my card. Luckily (and I think, deliberately), this money was taken at the end of the month shortly after pay day. The fact this might financially cripple the person they’re taking the money from seemingly doesn’t enter into their ethical code of conduct. and no refund is due. and we look forward to serving you in the future. Entirely generic and non-specific response – the ‘supporting documentation’ was a joke. Apart from just being a copy of what I had received in the post a few days after the money was taken, it in no way described any damage to the vehicle, or contained any kind of damage assessment. The only thing the paperwork described was the work that had been carried out – notably a full respray of the rear bumper, and the charges relating to that. There was nothing in the documentation to support WHY the work had been done, merely that it had been and that they were charging me for it. Now call me strange, but if I’m going to be charged £300 for something I will want to see a full damage assessment, with high resolution images, a professional write-up, and an opportunity to either have the work undertaken myself, or at least have the vehicle inspected by an independent third party. Carrying out the work without any notice or supporting evidence put me in a strong position to object. That and the fact the respray work was done more than 3 months after I rented the car – indicating the work clearly wasn’t urgent and hadn’t prevented them hiring out the vehicle in the meantime. That of course means that who knows what kind of additional damage could have been made to the car in that time that I’d be completely unaware of – all kinds of potential scuffs and scratches that I didn’t make but ended up being charged for! Damage repaired a long time after return of car. No notification work was being undertaken. Threat of small claims court action to recover funds. And in order to make Hertz feel as though they’re really under the microscope, I also included an official request for all of my personal data under the UK Data Protection Act, which requires Data Controllers (any company that holds and uses personal data for any purpose) to disclose the full extent of any information they hold about an individual, within 40 calendar days from the date of request. These requests are great, because they must also include internal memos, or internal correspondence that mentions you. Send this letter, and ALL letters, via Recorded Delivery and keep the reference number. Don’t use email – email is too easy to ignore, it will be dealt with too lightly (as in the generic response above), and does not convey the seriousness of your intentions. These points should be sufficient to pressure Hertz into giving you your money back, but if not be prepared to go to court. Don’t make this an idle threat. The weight of evidence and ethical integrity is with YOU – you can’t sign away your rights in a rental agreement. You might give permission to be charged for damage, but it doesn’t give Hertz, or any other car rental company, the right to arbitrarily determine what is or isn’t real damage, and how much they can just pluck from your bank account for it. The fact they don’t notify you, or provide proper documentation to justify it, gives you an enormously strong case that is worth pursuing. Small claims action is cheap for an individual to prosecute, and expensive for a company to defend. Unless they think they’ve got a rock solid case they just won’t bother with it – it’ll be far more economical to give you your money back. All you need to do is make the fuss and show you’re not going to be palmed off with cheap excuses and bland emails. In my case, Hertz did me a fantastic favour by failing to reply to my letter. I knew they had it – my recorded delivery receipt proved it – but they didn’t respond. Nor did they respond to my Data Protection Act request, which they are legally obliged to do. This allowed me to write a follow up letter a couple of months later, pointing out their failure to reply, my suspicion that their failure to reply was deliberate in the hopes I would ‘go away’, and the fact they’d failed to meet their obligation to provide me with copies of my personal data. I demanded an immediate reply, within 7 days, addressing all of my arguments, as well as the data I’d originally asked for. I also stated that I would be making a full complaint to the Information Commissioners office for their failure to adhere to the DPA. Again, I sent this letter recorded delivery. any lenght when down to the base coat. which resulted, regrettably, in the damage billing being made. that it has caused you. Now, Hertz are trying very hard here to have me believe that they’d made a simple mistake with regards to the size of the damage. They purposefully side-step my arguments about the lack of evidence of ANY damage, they don’t reference my Data Protection Act request, they don’t mention my indictment of their behavior in failing to notify me about damage work being undertaken or charges that would be incoming to my card. They deliberately admit no liability of any wrong-doing in their practices, and they’re very keen not to set a precedent that others can cite in future. This, they would have me believe, is all just an unfortunate mistake and they’re very grateful I pointed it out for them. The reality is, they know I have them bang to rights about the shoddy nature of the charge, they know that if they just give me my money back I don’t care about receiving a copy of my personal data. Indeed, the money has now been refunded and my personal data is nowhere to be seen. They know I’m not going to exhaustively pursue them for it, because I no longer need to. They’ve just hooked onto a convenient aspect of my argument (the one about damage size), that allows them to save face and worm out of the fact that the charge was never justifiable in the first place. I would have taken it to court, I would have won, and they know it – or at the very least, I made the threat clear and real enough for them to appreciate it wasn’t worth fighting. As a consumer you must, at all times, vigorously defend yourself against shady practices, because various companies will often ‘try it on’ with charges like this, safe in the knowledge that the majority of people won’t want to give themselves any hassle and so will just pay it. Don’t be a wimp, or a sheep, or a person too afraid to stand up to yourself. This issue was a little stressful to deal with, and it was annoying to have to write the letters, but that inconvenience is more than worth the £300 I’ve now got back, as well as standing up to the principle of not getting screwed over unnecessarily. Ultimately all I had to do was write two careful letters – and if you find yourself in this situation that’s probably all you need to do too. One final note: Stay POLITE. In all my communications I am indignant, and annoyed, but I am always polite. My descriptions of events are objective and written carefully in the correct tense. I never swear, I never insult the company in an antagonisic way (e.g. calling them ‘thieving arseholes’ is not a good argument) – I am simply firm and clear. This is advisable not least because it means you are taken more seriously, and should the matter ever actually go to a court, the presiding judge will want to see evidence of you being absolutely reasonable in your attempts to resolve the situation amicably. If you are able to show that, and also demonstrate how unreasonable the company has been in their response (or lack of), the case is yours to win.